Natural gas and propane leaks are a common problem that occurs in both residences and businesses. It can be difficult to address complex leak problems that occur due to faulty gas pipelines or connections. People often require the services of a professional leak detection and identification service such as Gas Leak Detectors in Victoria, in order to rectify these serious problems. Our high tech leak detection service uses advanced technologies like, infrared thermography, and helium leak detectors detect the cause and location of leaks with great precision. In its raw state, natural gas is odorless and colorless. It is formed within the Earth over millions of years. It is formed in the same manner as other fossil fuels from the decomposition of organic matter. Consumers obtain natural gas via many kilometers of gas pipelines after it has been extracted from earthen reservoirs and impurities have been removed. It is transported primarily as methane gas. What To Do If You Suspect A Leak? Methane and propane gas is used in gas stoves and ovens, water heaters, and home and office heating systems, it also has many industrial uses. Mercaptan is a pungent smelling acrid gas which is added to natural gas to make it detectable by consumers, since natural gas is colorless and odorless in its natural state. It is often described as smelling like rotten eggs. If you detect the pungent scent of mercaptan, if possible, you should turn off the main gas supply valve to your home or office building. Next, you should open all doors and windows in an attempt to dissipate the gas, and of course avoid creating any type of spark or flame that may ignite the gas. Then immediately contact Gas Leak Detectors on their 24 hour hotline at 1800 0 LEAKS ! Gas leaks seem to occur at some very inconvenient moments. You may be entertaining guests at home or meeting with a client in your office. In most instances, you will be unable to locate the root cause of the leak. In these cases, the best solution is to call in the professionals at Gas Leak Detectors, who can perform emergency gas leak repairs 24/7. They can locate the root cause of your gas leak, and repair it in order to remediate an otherwise dangerous situation. Why Contact Gas Leak Detectors – Melbourne? Gas Leak Detectors services the Melbourne metropolitan area. We are a certified and professional gas and water leak company. We provide extremely prompt and reliable service and we guarantee that your potentially dangerous leak will be properly repaired to avoid any potential damage or health risk to you and your family. 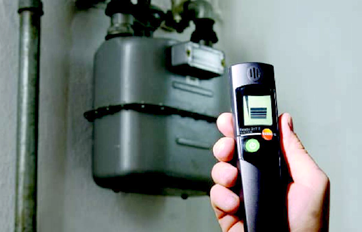 Gas Leak Detectors works to accommodate the needs of their commercial and residential customers immediately, by providing their expert leak detection and remediation services around-the-clock. Emergency gas leak detection and repair is available on a seven-day-a-week, 24 hour/day basis. If you are in need of our services, contact us on our hotline at 1800 0 LEAKS.